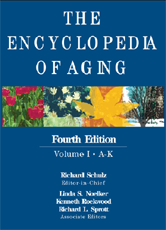 The Encyclopedia of Aging has proven to be the definitive resource for scholars and students across the burgeoning and increasingly interdisciplinary fields of gerontology and geriatrics. Like its three esteemed predecessors, the fourth edition contains concise, readable explorations of hundreds of terms, concepts, and issues related to the lives of older adults, as well as timely coverage of the many new programs and services for the elderly. Updated, under the distinguished stewardship of editor-in-chief Richard Schulz to reflect the infusion of new information across the scientific disciplines, this new edition brings readers up-to-the-moment significant advances in biology, physiology, genetics, medicine, psychology, nursing, social services, sociology, economics, technology, and political science. While retaining the format and standard of excellence that marked the first three editions, the fourth edition encompasses a wealth of new information from the social and health sciences. It contains the most current bibliography of an expanding literature, an exhaustive index, and extensive cross references. This much anticipated update of the field's most authoritative resource will take its place as an indispensable reference for specialists and non-specialists across a broad range of disciplines that now comprise the field of aging.